김영준은 바이얼리니스트겸 지휘자로서 일찍이 동아콩쿨 1위에 입상하였다. 서울음대 및 오스트리아 비엔나 국립음악원(Prof. Frantz samohyl 사사)에서 바이올린, 러시아 그네신 아카데미(Prof. Zinoviev 사사)에서 지휘를 공부하였다. 국내 유명 교향악단을 비롯하여 프랑크푸르트 쳄버오케스트라, 모스크바 필하모닉오케스트라, 오사카 필하모닉오케스트라, 도니에츠크 필하모닉오케스트라, 키에프 쳄버오케스트라, 키에프 필하모닉오케스트라, 소피아 필하모닉오케스트라 등과 협연하고 독일, 오스트리아, 헝가리, 우크라이나, 일본, 프랑스, 필리핀, 오즈베키스탄, 불가리아 등 현지 연주회를 통하여 국제음악회 및 해외 유명 오케스트라의 공연에 정기적으로 초청받고 있다. 독주회와 협연, 실내악 연주 등 많은 공연을 꾸준히 무대에 올리고 있는 그는 서울시립교향악단 악장을 역임 하였으며 “난파음악상(87년)” “이달의 음악가상” “올해의 음악가상(90년)” “한국음악가상(91년)” 그리고 오사카에서 열린 제17회 “World Peace Youth Culture Festival"에서 이탈리아 ISG로부터 ”New Renaissance Award(97년)“를 수상하였고, 2007년 실내악 운동을 통해 한국음악과 사회에 기여한 공적으로 ”한국음악대상“을 수상하였다. 활발한 음반활동으로 ”Apres un Reve" 소품집과 Beethoven Sonata "Spring & Kreuzer", "Violin in Sweet Dream"(Camerata), Wieniawsky 바이올린협주곡 제2번 (Star), Tchaikovsky 및 Mendelssohn 협주곡 (EMI)을 출반하였다. 현재 서울신포니에타 음악감독으로 활동하고 있으며 서울시립대학교 예술체육대 학장을 역임, 교수로 재직하고 있다. Violinist and Conductor YoungZun Kim studied Seoul National University, Vienna Music Hochschule (Prof. F. Samohyl) with honor. Later, he studied conducting at Russian Gnesin’s Academy with Prof. V. Zinovev. His professional career has started by winning the first prize at the Dong-A Music Competition, the greatest Music Competition in Korea. 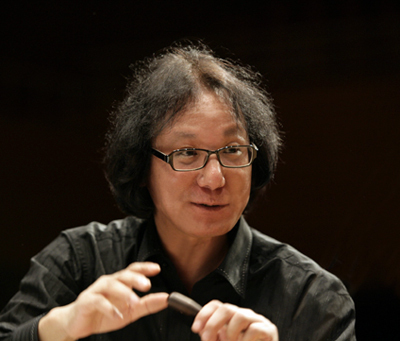 His energetic artistic activity both as a soloist and as a leader of chamber orchestra has been acknowledged by numerous awards such as "Nanpa Award"(1987), "Musician of the year Award"(1990), "Musician of the Month" , "Korean Musicians Prize"(1991), "New Renaissance Award" at the 17th World Peace Youth Culture Festival in Osaka, Japan from Italian ISG (1997). He was awarded "The Greatest Music Award of Korea"(2007) for his contribution to korean Music and Society by giving numerous Chamber Music Concerts. He published many recordings, such as "Apres un Reve", Beethoven Sonatas "Spring & Kreuzer", "Violin in Sweet Dream", Wieniawsky - Violin Concerto No.2. He has appeared as a soloist with Frankfurt Chamber Orchestra, Moscow Philharmonic Orchestra, Osaka Philharmonic Orchestra, Donetsk Philharmonic Orchestra, Kiev Chamber Orchestra, Kiev Philharmonic Orchestra, Sofia Philharmonic Orchestra, etc. He has given various concerts all over the world, including Hungary, Ukraina, Japan, France, Philippine, Uzbekistan, Bulgaria, Russia, and were criticized positively by greatest admirations. He receives many invitations for various international Music Festivals and periodic concerts	with orchestras as a soloist and conductor, and presently he establishes his firm status as the first class musician. 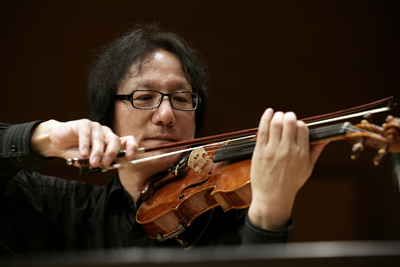 After serving as a Concertmaster at the Seoul Philharmonic Orchestra for 15 years, he is now soloist and director of Seoul Sinfonietta and professor of music at the University of Seoul.